Next to viscosity, specific gravity is a separate but equally important factor in optimizing a mixer. Without factoring this measurement into your mixer design, your results would not reach product specification. The term “Specific Gravity” (SG) is used to define the weight or density of a liquid as compared to the density of an equal volume of water at a specified temperature. The temperature used for measurement is usually 39.2oF (4oC), because this temperature allows water to assume its maximum density. In the metric system, water has a density of 1 gram/ml, so density and SG are numerically equal. If the liquid you are comparing has an SG lower than 1 gram/ml, it will float on water. If it has an SG higher than 1 gram/ml, it will sink. In the imperial system water has a density of 8.345 lbs/gallon; however the SG value of a product is exactly the same, since it’s based on a ratio. When it comes to configuring a mixer, knowing the specific gravity of the fluids being blended is important because it will influence the torque & horsepower that is required to properly mix your fluid. In applications with higher specific gravity, more torque would be required to produce the desired result. If specific gravity was not taken into consideration, and a mixer not optimized accordingly, results would be unpredictable, and motor damage and/or failure would likely occur. Hydrometer: Usually a cylindrical glass stem with a scale inside, and a bulb at one end weighted with mercury or lead. When lowered into a container of liquid, the calibrated glass stem will float freely in the fluid. 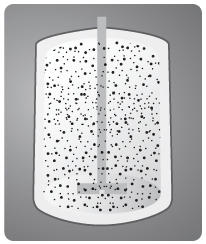 Using the point where the fluid surface touches the stem, a reading of the specific gravity can be taken directly from the scale. Specific-Gravity Bottle: A flask made to hold a known volume of liquid at a specified temperature (usually 20°C). The bottle is weighed, filled with the liquid whose specific gravity is to be found, and weighed again. The difference in weights is divided by the weight of an equal volume of water to give the specific gravity of the liquid. When combining liquids of different densities, the result is the formation of a new liquid with its own specific gravity. Variables to take into account are the SG measurement of each liquid, and the ratio at which they are blended in a mixture. If two fluids have largely different density, or include a solids component, they will be much more resistant to mixing. Improper mixer engineering would result in stratification and settling within the mixing vessel. Based on the above information and Stoke’s law, the solid settling rate can be calculated. The solid settling rate is crucial as it affects the amount of pumping required for the appropriate level of suspension to be achieved, therefore impacting the configuration of the mixer. For example, if the particle size of two products is the same and the specific gravity of the solids is different, the solids with the higher specific gravity will have a higher settling rate and in turn will require a larger mixer for suspension. The level of suspension, or suspension quality, required in an application is generally determined by how uniform the product needs to be. Suspension is achieved using the specific amount of fluid force or “pumping”. The higher the level of pumping, the higher the mixing intensity is. Mixing intensity is usually categorized as mild, medium, and vigorous. As the pumping level increases so does the level of uniformity. Correct impeller design is crucial to reaching and maintaining the quality of an application. Impellers that create an axial flow deliver an annular velocity (upward pumping force) necessary to ensure that solids remain in suspension. The rate of the flow in a tank needs to be greater than the solid settling rate, and the level of annular velocity achieved will determine the suspension quality created in the tank. As you can see, calculating and communicating the specific gravity of each of your mixing fluids to our sales engineers leads to the configuration of a mixer that will achieve great mixing results. Good technical information backed with the formulas to check your own applications. I like this aspect of your web presence.